Every December, my family pull names from a hat and exchange gifts accordingly(children are exempt from this, being duly showered with gifts as befits the season), and, for the second year in a row, I got my brother-in-law to shop for. The man is very into the classic video game console scene, but I had already gotten him NES and SNES USB controllers the previous year, so I needed to up my game. After giving it a bit of thought, I figured I had given him the hardware, now I should follow it up with some games. Knowing which games was easy, as I had just been playing through a game designed in a NES-era style. 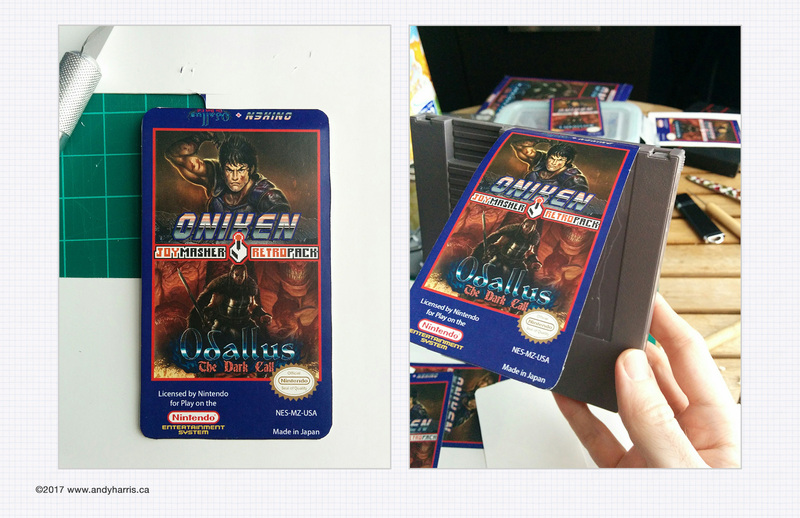 Odallus: The Dark Call, by JoyMasher was as authentic an experience you could find if you wanted “classic”. 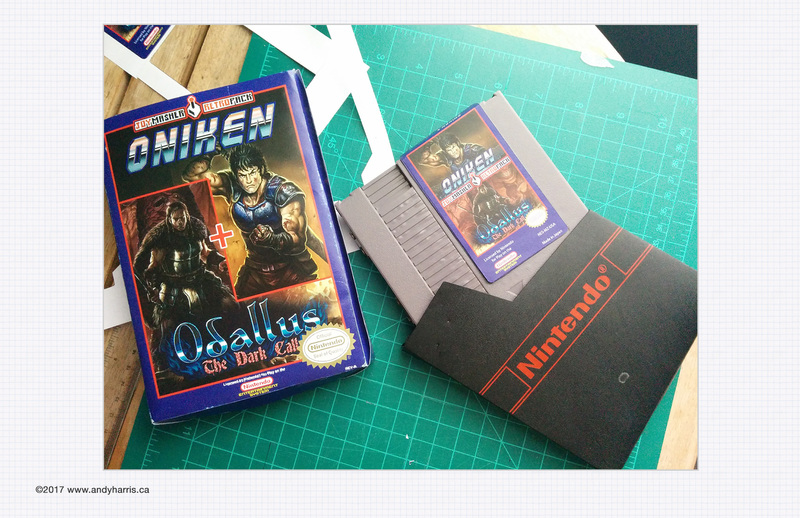 I bought copies of Odallus and Oniken, an earlier JoyMasher title. The gift keys included DRM-Free copies, so for ease-of-installation, I dropped the installers onto a USB key. Now, how to deliver the gift? I didn’t want to just send him an email with links to his gifts. I also didn’t want to just hand him a USB stick either. 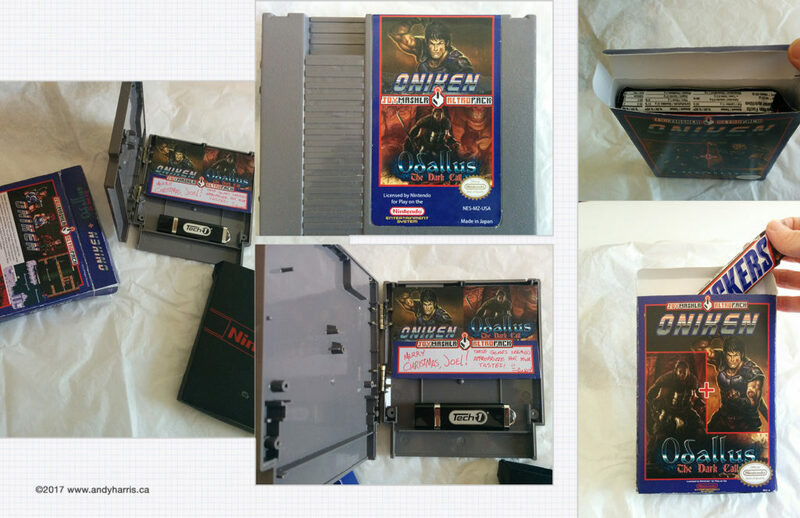 I thought, how hard could it be to gut a NES cart and put a USB key inside? 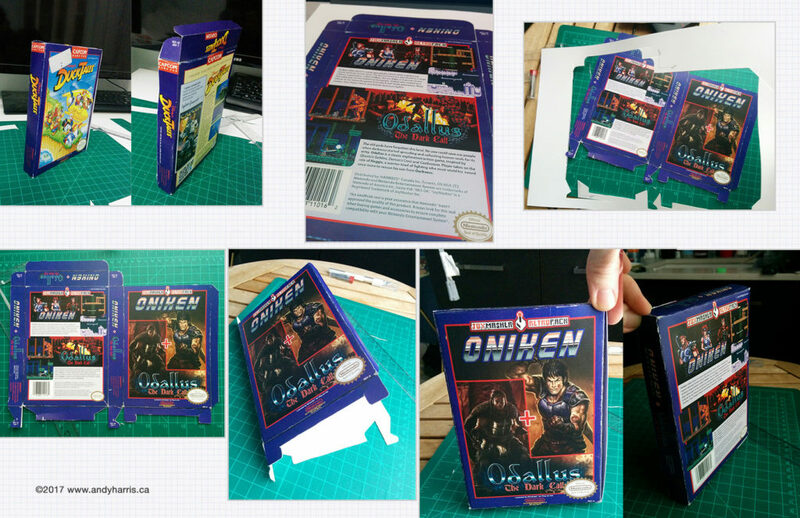 Once I decided to go ahead with designing a new label for the cart, the box art was a natural next step. I designed the label sort of by memory of how the Super Mario / Duck Hunt carts divided logo/art space, all framed in a deep blue/purple of a Capcom label. I used Capcom art direction as a base for this JoyMasher RetroPack Special Edition(lol) because it’s immediately recognizable as a classic NES property. I found some fantastic Cover Art by Dudu Torres that was detailed far beyond anything you’d see on the screen once you popped the cart in- a not-so-uncommon occurrence, I felt it added an air of authenticity. I wanted him to be able to display this on a shelf with the rest of his NES collection and have it not seem out of place. A curiosity for a keen-eyed guest to puzzle over. For the box, I found a quality scan of Capcom’s Duck Tales, complete with distressed cardboard seams and flaps. As a template, it was exactly what I was looking for. I swapped out the box art for my new layout, grabbed blurbs of the games from their websites and made sure all the warnings and warranties and print marks were faithfully recreated. 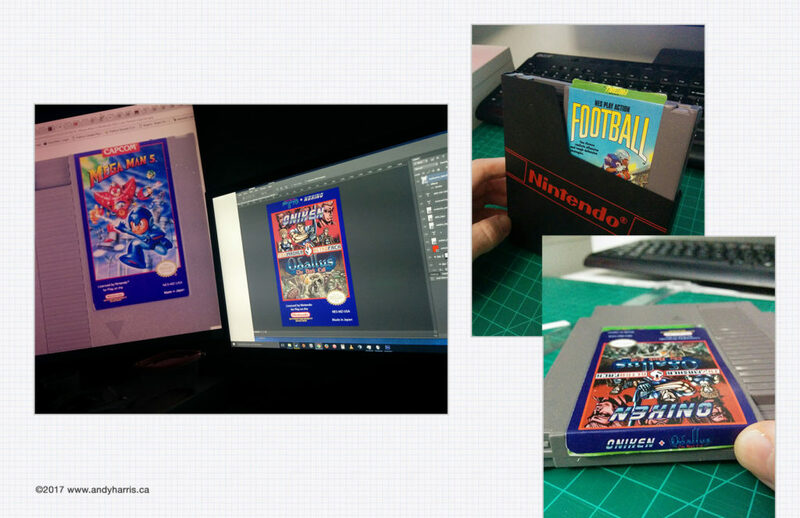 I wrapped all of it in an over-arching “JoyMasher*RetroPack” branding, slapped a Nintendo Seal of Quality on it, and sent it off to print. 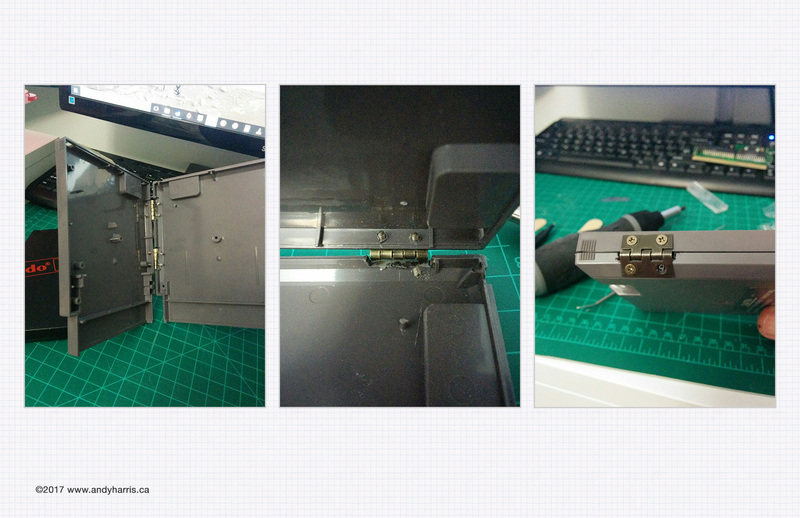 Once I had the wrapping/product packaging figured out, I still had to turn a cart into a container with hinges to hold my USB of retro goodness. I picked up a dusty old game from a shop on Spadina and spent an afternoon learning all about the Nintendo Security Screw. After a bit of ingenuity and a small application of brute force, the screws were out and I got to work on carving out places for some small hinges. Luckily, a NES cart has a small locking clip right on its top corners, so I could file that down to make it hold without holding *too* much. A light pull would be enough to open the cart. I printed the box on some card stock and I printed the cart label with a sticker backing. I realized, right after I finally put it all together, cart-in-sleeve-in-box—- NES games always had some sort of styrofoam baffle to fill out the final inch or so of the box! Not having any blocks of styrofoam handy, I filled it with the next best thing.